The company introduced new Apple TV 3.0 software witch gives us not more than a redesigned main menu – that is said to give a faster access to the content, possibility to watch iTunes Extras and enjoy iTunes LP in fullscreen and listen to the internet radio (including stations in high-quality HE-ACC formats). Adding only cosmetic changes to a device with such a huge potential doesn’t mean Apple gave up developing Apple TV and converting it to a set’top box with all the capabilities offered by the HD market, but it gives a next signal that the company will do nothing that would pull people away from iTunes. On-demand HD movie rentals and purchases, HD TV shows, music and podcasts from the iTunes Store give Apple millions. 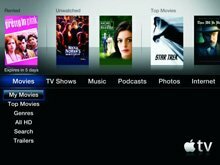 According to the company, Apple TV gives direct access to a catalog of over 8,000 films on iTunes including over 2,000 in HD video available for rent or purchase. Users can also choose from a selection of 11 million songs, 10,000 music videos and over 50,000 TV episodes. Renting a movie in iTuens runs from $3 to $5, buying would costs us $14,99. And there are 65 million users of iTunes out there. “HD movies and HD TV shows from iTunes have been a huge hit with Apple TV,” confirmed Eddy Cue, Apple’s vice president of Internet Services. Adding anything that would take Apple from iTunes revenue (like additional drive – Blu-ray or, at least DVD, IP streaming or live TV) wouldn’t have any sense from the economical point of view. The only thing can happen is that Apple will add to the Apple TV an access to App Store to maximize revenues from the application market. Piper Jaffray analyst Gene Munster predicts that Apple will sell 6.6 million AppleTV units this year. The new Apple TV software is available immediately free of charge to existing Apple TV owners. Apple TV with 160GB capacity is available for $229. Apple TV requires an 802.11b/g/n wireless network or 10/100 Base-T Ethernet networking, a broadband Internet connection and a high definition widescreen TV. Apple has also released iTunes 9.0.2, adding support for Apple TV 3.0.